. يعمل Witches Falls Cottages على ضمان إقامة مريحة لضيوفه من خلال خدماته الممتازة وحسن ضيافته. لضمان راحة ضيوفه، يقدم الفندق الخدمات التالية: واي فاي مجاني في جميع الغرف, مرافق مخصصة لذوي الاحتياجات الخاصة, تخزين الأمتعة, واي فاي في المناطق العامة, صف السيارات . في الفندق غرف نوم يتجاوز عددها 8، كلها مجهزة بعناية وجمال وبعضها مزود بـ تلفزيون بشاشة مسطحة, اتصال لاسلكي بالإنترنت, اتصال لاسلكي بشبكة الإنترنت (مجاني), حوض الاسترخاء, غرف لغير المدخنين. سواء كنت من محبي الرياضة أو كنت تتطلع لتفريغ عناء نهار صعب، ستجد خدمات ذات مستوى عالي بانتظارك كمثل مسار جولف - ضمن 3 كم, سبا, تدليك, حديقة. اكتشف مزيجاً ساحراً من الخدمة الاحترافية والخيارات الواسعة من وسائل الراحة والمتعة في Witches Falls Cottages. What a fantastic place. The food was amazing and we loved the bathroom. My wife and I needed a break so I booked based on the existing reviews and the pics on Agoda. When I arrived I was immediately reassured of my decision. Kelly was in reception and an absolute delight, so helpful, informative, friendly and all without being in your face, just simply helpfuk and friendly. We stayed two nights and ate at LEAF Japanese Restaurant on Kelly's recommendation, AMAZING, then went on the Glow Worm Rainforrest tour on Kelly's reccomendation... Breathtaking! Book Witches Falls Cottages, you'll be glad you did! We were delighted with the deliscois breakfast basket that was delivered to our door, orange juice, a warm fresh loaf of bread with deliscous bacon, sausages eggs, mushrooms, tomato etc for is to cook on our own private BBQ. Area was great, team were very knowledgeable and breakfast basket was great. Would highly recommend for couples. Thanks Lorraine, see you again soon. So thoughtful and peaceful. They thought of everything. The breakfast hamper was amazing!!! The quite setting, the huge breakfast hampers, the friendly owners and the amazing accommodation. Third time staying here and gets better every time. 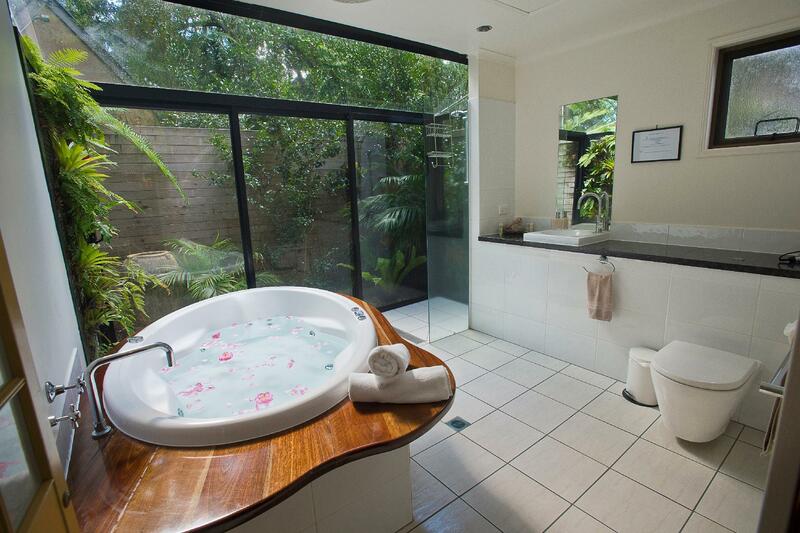 Loved the spa bath and shower setout in a glass room. 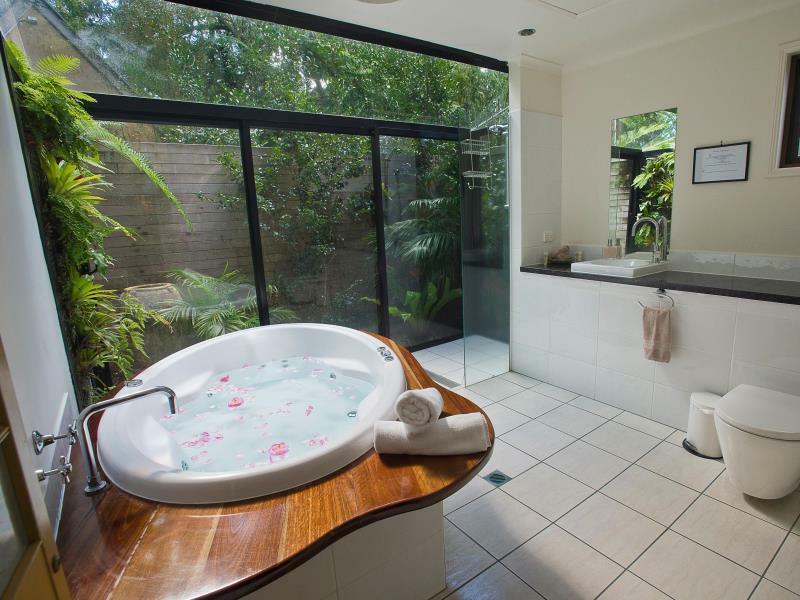 Absolute privacy, Superb cottage, Awesome spa under the stars. This was our second stay here and better than the last. Upon arrival you are treated like a member of the family from the hosts - David and Daniela. 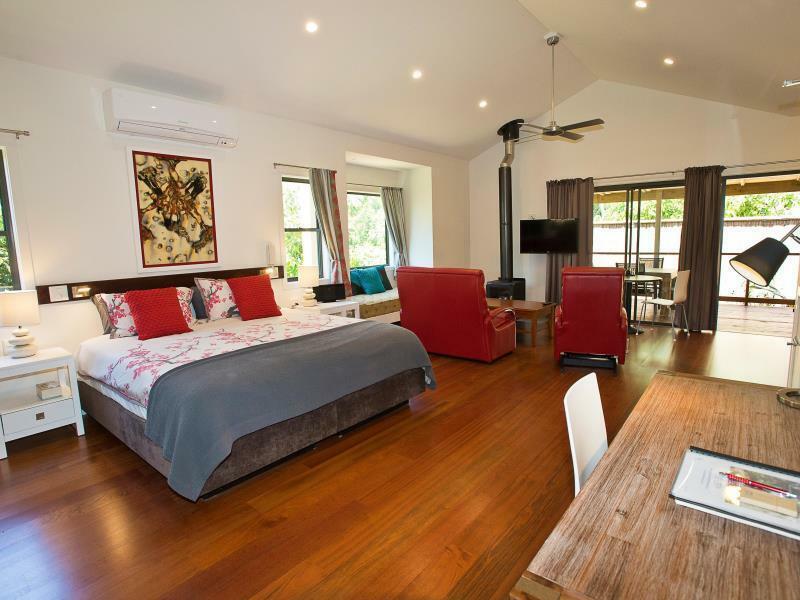 The Fully self-contained cottages are set among tropical gardens and tall trees linked by pathways. Beautiful accommodation and private deck, cosy fireplace (with wood delivered secretly everyday), to huge bathrooms under the stars (straight out of a magazine) to wonderful breakfast hampers delivered to your door at 8 am (containing a wide range of delicious goodies and home made bread - THE BEST EVER). Mt. Tambourine is a special place with loads of bush walking, sightseeing and plenty of attractions to see, catering for everyone's tastes. The breakfast hampers, the size of the cottage and the friendly service. Friendly staff, a great destination for a relaxing time. 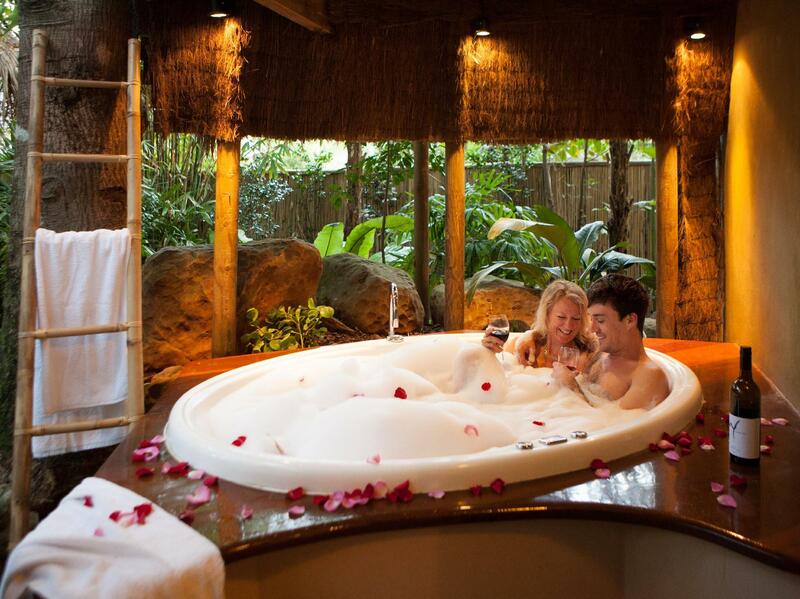 The cottages are adorable and designed for couples. The stuff at the cottage is extremely friendly, and they give us all the guide and information on the day of arrival. Everything is so well taken care of, and the breakfast is awesome with the private bbq facilities. You will notice that the Owner is very generous with the drinks, tools and there is even a free wifi, DVD for rental which is free of charge. i would definitely recommend this place for couple to relax on the mountain. However, the hotel can only be access by car . It was great, but the resident bird tapping on the window did not make for a very relaxing sleep-in! From the moment we arrived and were shown to our cottage by our host David we knew it was going to be a magical experience. The cottages are set ammongst what feels like an enchanted forest with pathways through the gardens which lead to each totally separate cottage. Beautifully decorated with fireplace and everything you need. Breakfast hamper delivered to our door (waiting for us on outside table setting) containing a wide range of delicious goodies. I'd go back tomorrow. 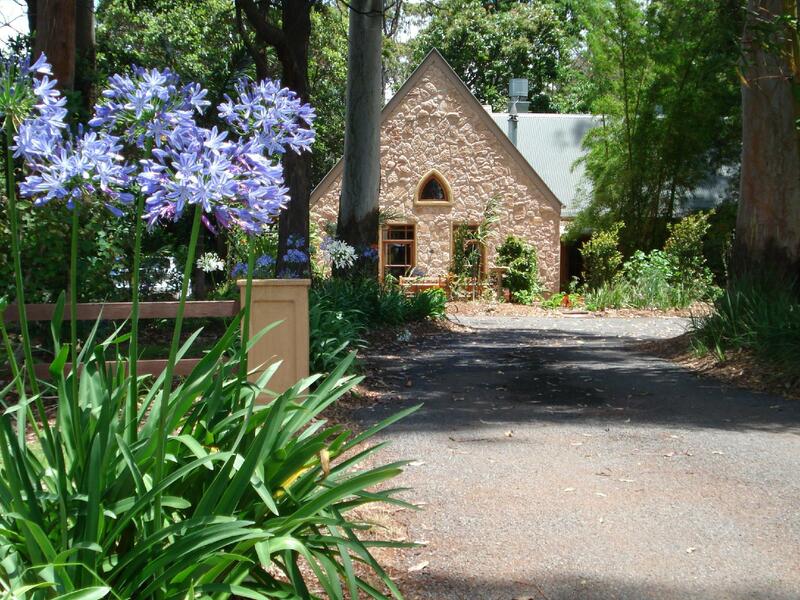 Tamborine mountain is a special place - like another world away - we'll definitely return more often now that we've discovered Witches Falls Cottages. 밤에 별도 잘 보이고 공기도넘 좋고 아침밥은 비비큐랑 로칼중에 선택할 수 있는데 로칼이 나은듯. 밤에 나무로 불난로떼우는거 굿굿 덕분에 따뜻하게 잠. 밤에 바베큐 스파시설도 굿.